Justin Archangel, the president of Class Council, said The Store will be able to expand its reach when it's run by a student organization starting in the fall. Students who run the University’s first food pantry will form a student organization in the fall as the pantry becomes a permanent campus resource. 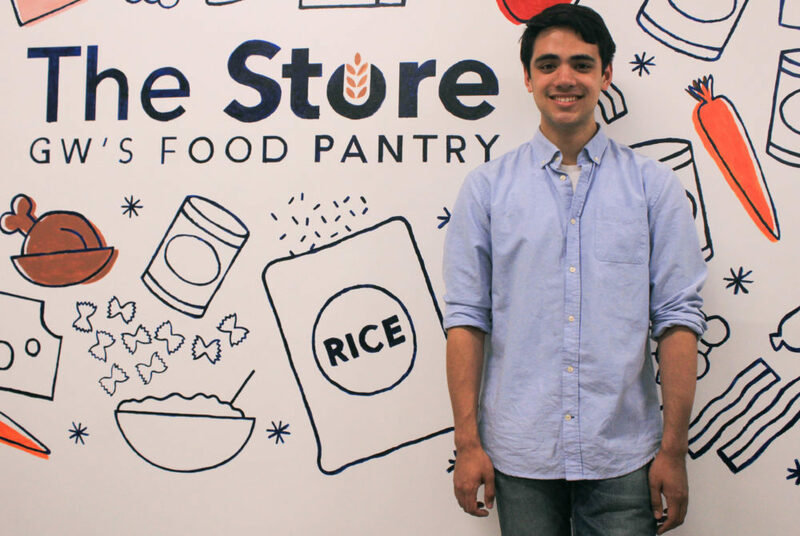 A student executive board will run The Store – a food pantry for students who experience food insecurity – with a general body of student members, as it moves into its second year of operation. The group’s leaders said the change will allow a group of students to focus only on running the pantry as they seek to start a larger conversation about food insecurity on campus. This year, GW Class Council and the Center for Student Engagement jointly ran the pantry from District House, where students could anonymously request food donations. Starting next semester, both will continue to support The Store’s outreach and events but will turn major decision-making and the daily operation of the pantry over to the new executive board. Freshmen Sarah Sem and Saru Duckworth will lead the six-member executive board as president and vice president, respectively, of the organization. Sem said the group wants to make more students and staff aware of its services and build more partnerships with the community. One of The Store’s primary goals next semester will be to increase the visibility of the pantry on campus, she said. “We also hope to further promote an open dialogue and to combat the stigma surrounding this nationwide issue. We aim to support similar initiatives at our neighboring universities,” Sem said in an email. The organization is slated to hold its first event, a barbecue competition among several student organizations, April 24 in Kogan Plaza. The event will raise money for pick-ups from local food banks and get more students talking about food insecurity, Sem said. Duckworth said she plans to recruit new student members of the organization to volunteer for the pantry because it relies on volunteers. “We would love volunteers to become members of our general body and help us promote The Store both as an organization and as an important community resource,” she said. Nate Pasko, the chairman of the Student Association’s finance committee, said The Store will receive about $1,000 for fiscal year 2018. Half of the funding will help rent vans to transport food from local food banks and the other half will be for purchasing an iPad Mini to take inventory, Pasko said. Tim Miller, the associate dean of students, said the move will make sure that the food bank is solely student-run – a goal officials had for the project from its inception. “Students serving students is a core value of The Store and GW, and we are incredibly proud of what we know these student leaders will do in taking The Store to new heights,” he said in an email. Miller said that the pantry will continue to work with other organizations and companies – like Class Council, Capital Area Food Bank and Whole Foods – that helped launch the pantry last fall. Justin Archangel, the president of Class Council, said in an email that a formal executive board will give the pantry the attention it needs to expand its outreach. Archangel added that it has been humbling to watch The Store go from serving just 20 students when it first opened to now helping more than 550. Clare Cady, the co-director and co-founder of the The College and University Food Bank Alliance, an organization that helps students start and sustain food banks on college campuses, said that because students involved with the food bank will eventually graduate, campuses may struggle to sustain food banks after they start up. But by becoming a student organization, the pantry will make sure there are new leaders each year who are trained by previous leaders, she said. This article appeared in the April 17, 2017 issue of the Hatchet.